In the world of hunting, archery elk hunting is a true measure of test and skill. Understanding one’s quarry is key. Elk are not only one of the largest game animals to hunt, they are also one of the shrewdest. This alone makes them a true challenge for even the most experienced hunter. Add to this the use of a bow and arrow and the need for exceptional skill is doubled. A bow hunter must know their quarry and their weapon on top of being able to calculate a number of variables in a given second it takes to draw and release their bow. 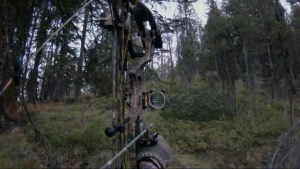 Archery elk hunting needs the type of bow that is designed to take down a large animal. This is truly an extraordinary piece of equipment. In general, one begins with a smaller model bow and works their way up once the choice is made to pursue this type of sport regularly. One must learn every aspect and capability of their weapon. This is also true of arrows. They must be of the proper length and have the capability and quality to pierce tough hide and cartilage for a quick kill. It takes many hours of practice to be able to effectively make the shot that will bring down an animal that can weigh up to seven hundred pounds. When it comes to archery elk hunting, bow hunters pay attention to every detail. Not only do they practice shooting in heavy coats or coveralls, they are likely to spend time learning the location of food and water sources for elk in the area. They learn the patterns of their quarry according to time of day and temperature and spend time reading local wildlife reports. If hunting from tree stands, a hunter can spend time alternating between two or three stands to gain better perspective of the location. All this will take place before the hunt ever begins. There are guided hunting trips specifically geared for an archery elk hunt. These outfitters are able to provide services that are tailored to the bow hunting experience. Whether one is a seasoned hunter or a first timer, experienced guides can help a hunter put their skill and proficiency with a bow to the ultimate test. Those who take part in archery elk hunting tend to find great satisfaction in the hunt, especially when it results in bagging their trophy. Even when it does not, many hunters are still grateful for the learning experience. A good hunter knows that knowledge is power and that it will lead to future success in the field.